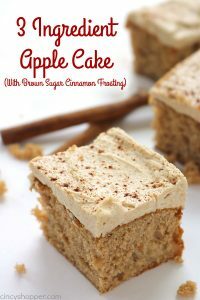 If you are a fan of simple recipes, you will want to make this Easy 3 Ingredient Apple Cake with Brown Sugar Cinnamon Frosting. 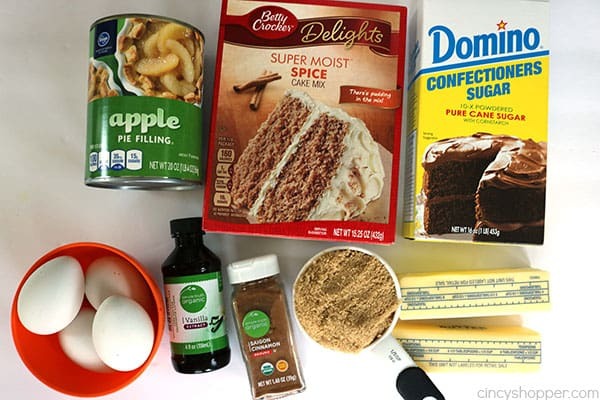 All you will need is a spice cake mix, apple pie filling, and eggs. 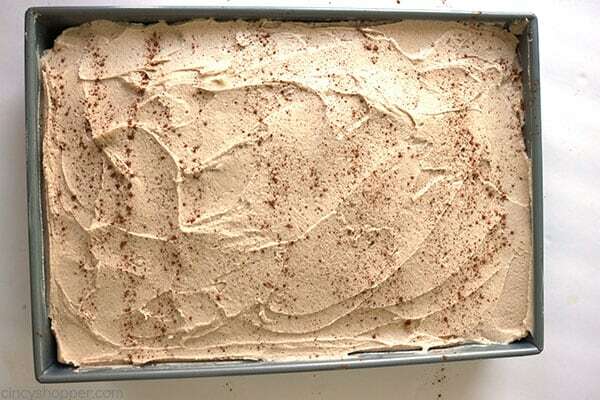 Enjoy as is, add on whipped topping or frosting. Most schools are back in session from summer break. Fall is arriving way too quickly. When summer comes to an end, we are all about the apple and pumpkin recipes here on my blog. I like to share quick and easy recipes that most anyone can make. 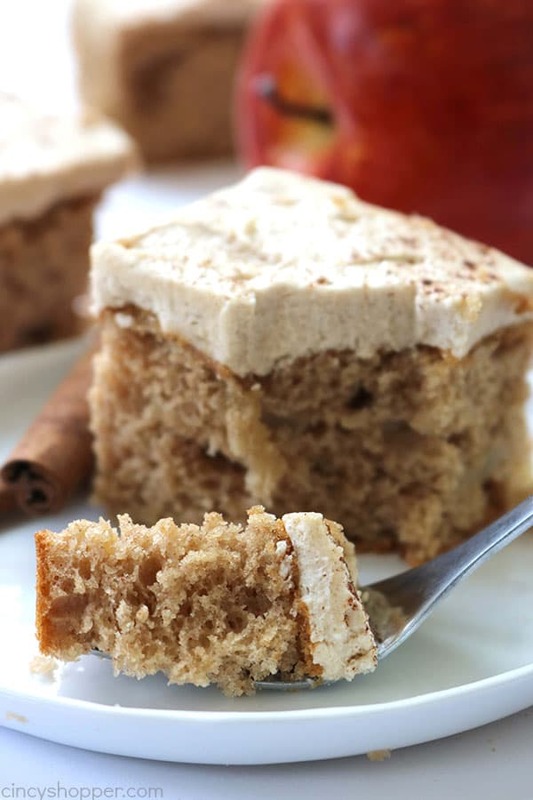 One of my popular recipes for fall happens to be our Apple Pie Cupcakes with Brown Sugar Cinnamon Frosting. They are popular with my family and on the web (They have been pinned 230K + times on Pinterest). 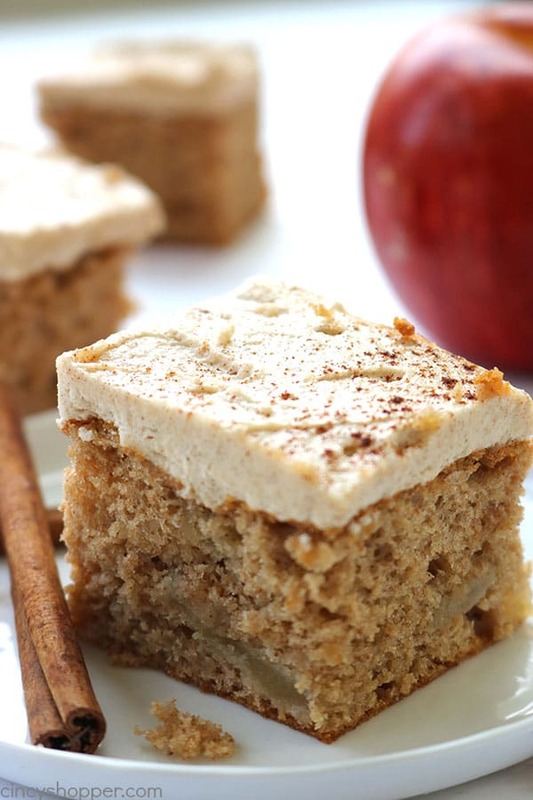 I think they are so popular because they are so simple and they make for a perfect fall dessert. When I was scrolling through my Facebook feed last week, I came across a video from Loves Bakes Good Cakes. 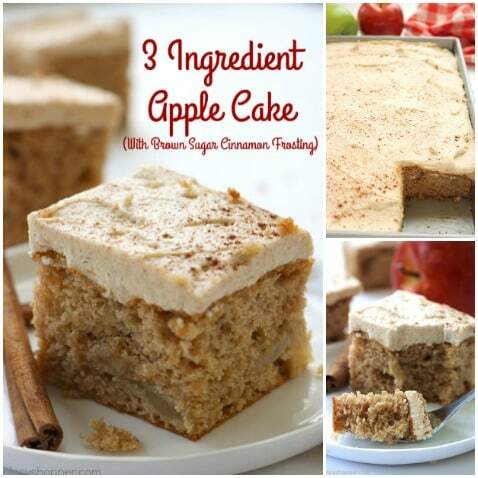 She shared a simple recipe for a 3 Ingredient Apple Cake. I loved her idea. Easy and no huge list of ingredients. Just what I like! I decided to use a spiced cake mix. 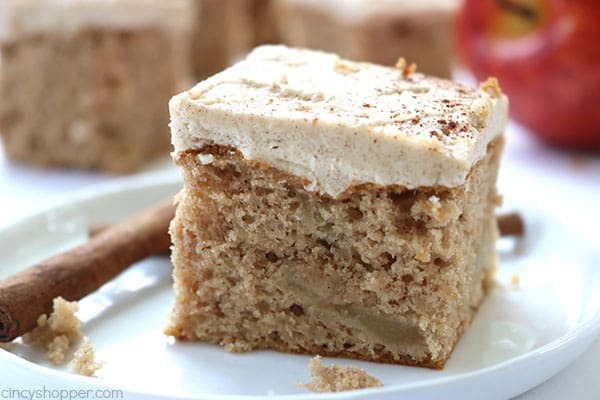 I think the spice cake mixes complements the apple cinnamon and sugar spices so well. She topped her cake with a simple whipped cream. 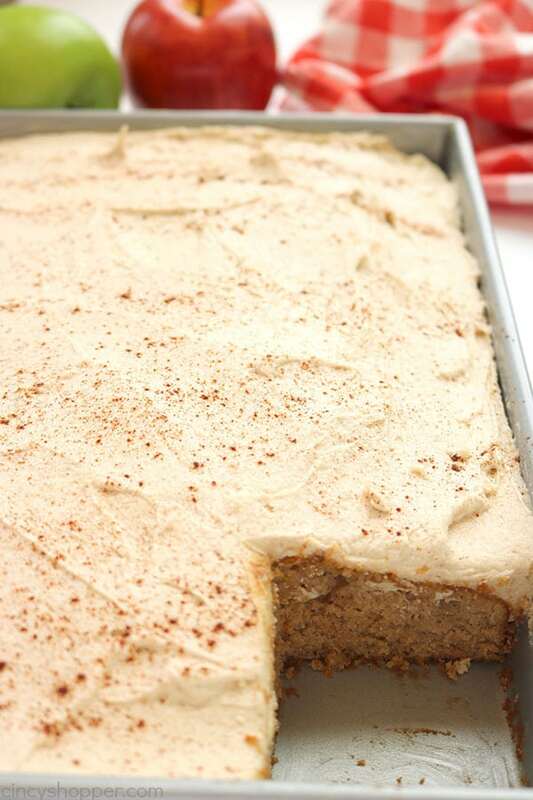 I think that would be great but the addition of the Brown Sugar Cinnamon Frosting made this cake over the top delish. 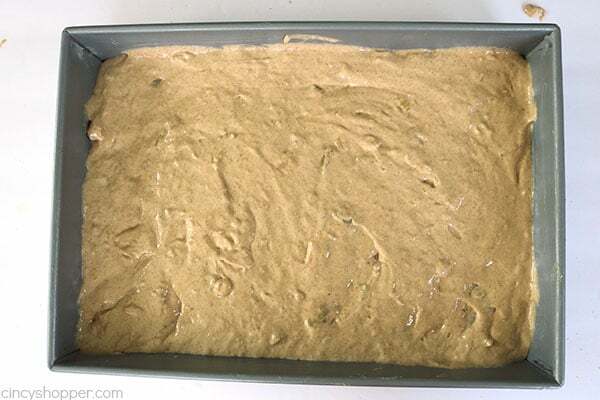 Like I said you can keep this cake simple by using just the 3 ingredients, cake mix, store bought apple pie filling, (or Homemade Apple Pie Filling) and eggs. Then just top with whipped cream. 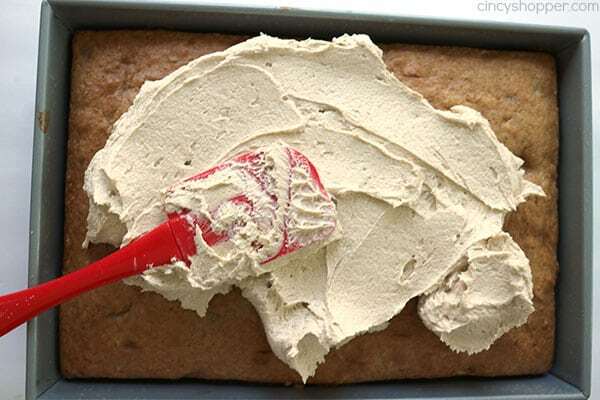 Or make this cake extra special with my brown sugar cinnamon frosting. It really takes the cake to whole other level. Beat together cake mix, pie filling and eggs until well blended (there will still be chunks of apple). Bake for 25-30 minutes or until toothpick inserted comes out clean. Whip butter, brown sugar, cinnamon and vanilla for until fluffy. Add milk until you reach desired consistency. 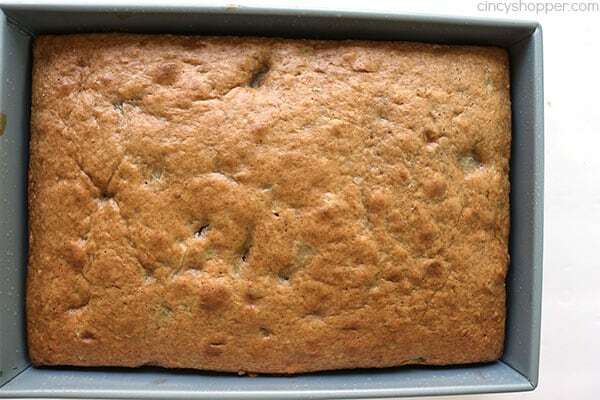 Adapted from: Love Bakes Good Cakes! 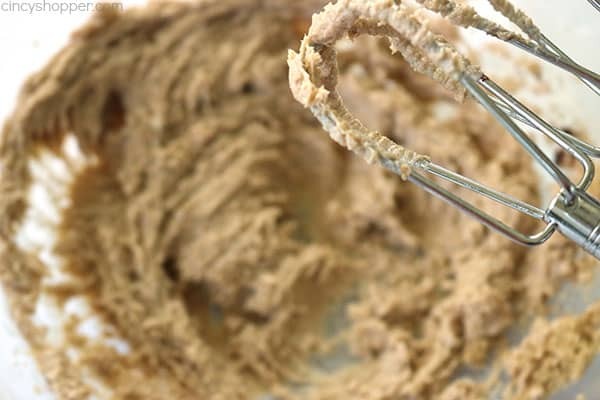 Do you have a favorite 3 ingredient fall dessert? 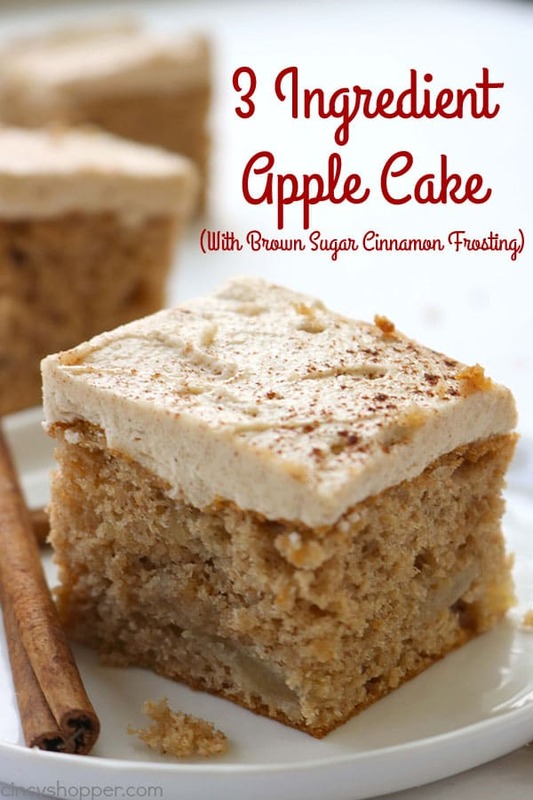 I love apple cake and adding the frosting is just perfect!